This is a list of works in English about the Aztecs. All are scholarly, well-written works by leading authorities on the Aztecs, and most are not too technical or specialized. At least some of these books will be found in most public libraries, and college libraries should have most of them. Much scholarly work on the Aztecs, particularly archaeological research, is published in articles in professional journals, and in chapters in edited books. I have only included a a few journal articles here. Students who want information that is up-to-date and/or more detailed or technical should consult journals (see below) and technical reports, as well as books and articles in Spanish. Much important work is published in Spanish and is not available in English. The bibliographies of most of the books in this list have citations to the professional literature. 1982 The Aztecs of Central Mexico: An Imperial Society. Holt, Rinehart and Winston, New York. 1996 The Aztec World. Smithsonian Institution Press, Washington, DC. 2003 The Aztecs, 2nd edition. Blackwell Publishers, Oxford. 1961 Daily Life of the Aztecs on the Eve of the Spanish Conquest. Stanford University Press, Stanford. 1997 The Essential Codex Mendoza. University of California Press, Berkeley. 1962 Five Letters of Cortés to the Emperor. Translated by J. Bayard Morris. Norton, New York. 1993 The Codex Borgia: A Full-Color Restoration of the Ancient Mexican Manuscript. Dover Publications, New York. 1971 Book of the Gods and Rites and The Ancient Calendar. Translated by Fernando Horcasitas and Doris Heyden. University of Oklahoma Press, Norman. 1994 The History of the Indies of New Spain. Translated by Doris Heyden. University of Oklahoma Press, Norman. 1963 The Conquest of New Spain. Translated by J. M. Cohen. Penguin, New York. 1962 The Broken Spears: The Aztec Account of the Conquest of Mexico. Beacon Press, Boston. 1995 Codex Telleriano-Remensis: Ritual, Divination, and History in a Pictorial Aztec Manuscript. University of Texas Press, Austin. 1950-82 Florentine Codex, General History of the Things of New Spain. 12 books. Translated and edited by ArthurJ.O. Anderson and Charles E. Dibble. School of American Research and the University of Utah Press, Santa Fe and Salt Lake City. 1987 The Aztec Templo Mayor. Dumbarton Oaks, Washington, DC. 1994 Economies and Polities in the Aztec Realm. Institute for Mesoamerican Studies, Albany. 1994 The Offerings of the Templo Mayor of Tenochtitlan. Translated by Bernard R. Ortiz de Montellano and Thelma Ortiz de Montellano. University Press of Colorado, Boulder. 1988 The Great Temple of the Aztecs. Thames and Hudson, New York. 1992 Archaeological Research at Aztec-Period Rural Sites in Morelos, Mexico. Volume 1, Excavations and Architecture / Investigaciones Arqueológicas en Sitios Rurales de la Epoca Azteca en Morelos, Tomo 1, Excavaciones y Arquitectura. University of Pittsburgh Memoirs in Latin American Archaeology 4. University of Pittsburgh, Pittsburgh. 1996 Aztec Imperial Strategies. Dumbarton Oaks, Washington, DC. 2000 Stories in Red and Black: Pictorial Histories of the Aztecs and Mixtecs. University of Texas Press, Austin. 1985 The Jade Steps: A Ritual Life of the Aztecs. University of Utah Press, Salt Lake City. 1991 Aztecs: An Interpretation. Cambridge University Press, New York. 1973 The Aztecs: A History. University of Oklahoma, Norman. 1987 The Aztec Empire: The Toltec Resurgence. University of Oklahoma Press, Norman. 1964 The Aztecs Under Spanish Rule: A History of the Indians of the Valley of Mexico, 1519-1810. Stanford University Press, Stanford. 1997 Myths of Ancient Mexico. Translated by Bernard R. Ortiz de Montellano, and Thelma Ortiz de Montellano. University of Oklahoma Press, Norman. 1988 Aztec Warfare: Imperial Expansion and Political Control. University of Oklahoma Press, Norman. 1995 Law and the Transformation of Aztec Culture, 1500-1700. University of Oklahoma Press, Norman. 1963 Aztec Thought and Culture: A Study of the Ancient Náhuatl Mind. University of Oklahoma Press, Norman. 1969 Pre-Columbian Literatures of Mexico. University of Oklahoma Press, Norman. 1992 The Nahuas After the Conquest: A Social and Cultural History of the Indians of Central Mexico, Sixteenth Through Eighteenth Centuries. Stanford University Press, Stanford. 1983 Art of Aztec Mexico: Treasures of Tenochtitlan. National Gallery of Art, Washington, DC. 1990 Aztec Medicine, Health, and Nutrition. Rutgers University Press, New Brunswick. 1983 Aztec Art. Harry N. Abrams, New York. 1993 Aztec and Maya Myths. University of Texas Press, Austin. 1997 Aztec Science. In Encyclopaedia of the History of Science, Technology, and Medicine in Non-Western Cultures, edited by Helaine Selin, pp. 142-146. Kluwer, Dordrecht. 1998 Huitzilopochtli's Conquest: Aztec Ideology in the Archaeological Record. Cambridge Archaeological Journal 8:3-14. 2000 Otumba and its Neighbors: Ex Oriente Lux. Ancient Mesoamerica 11:247-266. 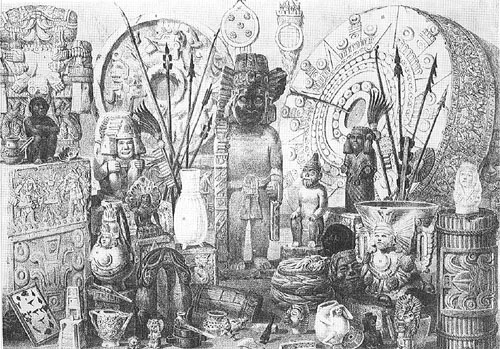 1998 Archaeological Views of Aztec Culture. Journal of Archaeological Research 6:197-238. 2001 The Ballcourt in Tenochtitlan. In The Sport of Life and Death: The Mesoamerican Ballgame, edited by E. Michael Whittington, pp. 88-95. Thames and Hudson, New York. 1992 Aztec Writing. In Epigraphy, edited by Victoria R. Bricker, pp. 53-69. Supplement to the Handbook of Middle American Indians, vol. 5. University of Texas Press, Austin. 2000 Aztec City-States. In A Comparative Study of Thirty City-State Cultures, edited by Mogens Herman Hansen, pp. 581-595. The Royal Danish Academy of Sciences and Letters, Copenhagen. These are scholarly journals, most of which appear four times annually. Articles in these and other journals usually have more up-to-date information on Aztec research than do the books listed above. The Aztec News: The Greatest Newspaper in Civilization. By Philip Steele. 1997. Candlewick Press, Cambridge, MA. What do we Know About the Aztecs? By Joanna Defrates. 1992. Peter Bedrick Books, New York. The Aztecs (See-Through History). By Tim Wood. 1992. Viking Books, New York. Eyewitness Books: Aztec, Inca and Maya. By Elizabeth Baquedano. 1993 Alfred Knopf, New York. This page was produced by Dr. Michael E. Smith, Professor of Anthropology, University at Albany, State University of New York. To go to Michael E. Smith's home page, Click Here.